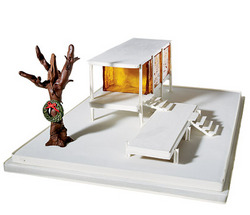 Looking for a way to help out the flood-damaged Farnsworth house? And satisfy your weekly dose of Miesian Delusions? Buy a cake! The gingerbread Farnsworth is by April Reed Cake Design in New York City; 15% of its $4,320 USD cost will go to the restoration. Via the ever tasty materialicious.